We said goodbye to one of our “babies” today, the 2002 Red Saab 9-3 SE, known to us and on this blog as “Red”. 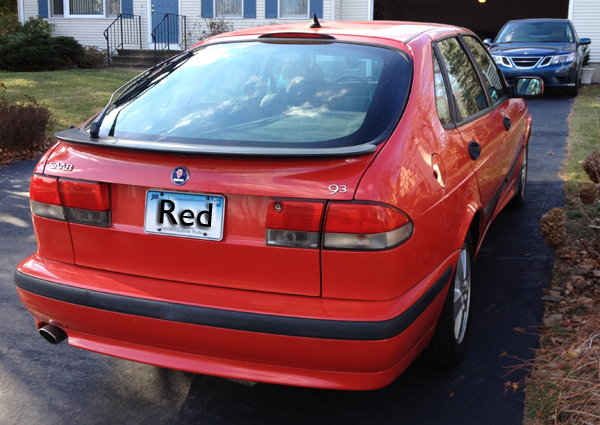 “Red” was the first of two, nearly identical, twin red 2002 Saab 9-3’s we owned, and was # 5 of our 9 total Saabs. While I sort of don’t care about or for naming cars, the name was given to this car because we had 4 Saabs in total when we bought this car, and color was the easiest way to refer to the cars between us, and there was confusion otherwise between us trying to commnuicate to one another who was taking which Saab on any given day. While we only put 33,000 miles on red in 10 years, it was a stellar car to own. Never let us down, never got us stuck, always started, always rode and ran well and did not make a lot of money for our dealer at our expense. Originally bought as a plan ahead replacement for our then aging 1993 900 Turbo, red ended up living in the garage while our 1993 and 1994 900 Turbos lived outside. 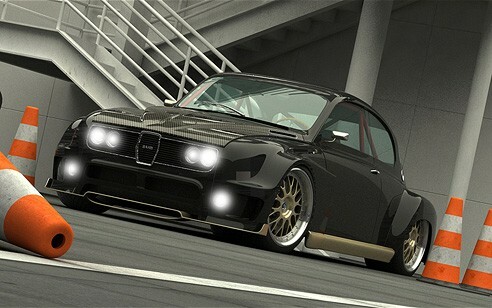 Red was the 2000 Viggen’s second garage mate. Red was purchased as part of our plan to keep enjoying manual transmission, hatchback Saab turbos long after Saab stopped producing hatchbacks in 2002. As of today, red is moving north to a new home with a new Saab owner, replacing their 1995 900S. While I am glad some sense to move towards the more mundane life of having two drivers and only 3 cars to care for, I am, we are deeply saddened to see this car leave. Mrs. Saabnuts agrees, if we had the money, we’d have a Jay Leno grade facility FULL of Saabs of all ages and maintain them all as close to factory fresh condition as possible. We don’t have the budget for that and 4 cars for 2 drivers? A lot to balance to make sure they ALL get driven, maintenance and loved and enjoyed equally. A few less treks to our dealer for routine maintenance, much as I love the dealer? Easier all around. I don’t know that we will ever be able to buy new or even slightly used Saabs of the sort we like again. This is a milestone we did not enjoy, parting with another Saab, and honestly each Saab we’ve said goodbye to was a difficult experience. We really love and appreciate these cars every single time we drive them. We have to be and are thankful to have owned 9 of them so far. I’m also thankful for the nice people we met along the way, even in the process of selling this car and during the recent sale of our 1978 Saab 99 Turbo, thanks to Saabnet.com classified ads. One of our neighbors and one of the many fellow Saab owners saw us saying goodbye to red today and gave me a knowing a sad nod, having recently parted with his 2002+/- 9-3 convertible himself. So it stinks that we don’t get to drive that “red” car anymore and revel in how much we love owning and driving that Saab, or even to see Red sitting in the driveway awaiting our next road adventure together. We’ve owned as many as 6 Saabs at the same time, we’ve had 4 or 5 at a time since 2007, so to have only 3 now, just feels weird and sad. I am a Saabnut, and I freely admit it. Don’t care what anyone thinks about it. WE BOTH appreciate these cars thoroughly, aesthetically, but also as nothing else for our tastes, drives or feels like a Saab, nothing else is as much fun, while still being incredibly practical and safe. Nothing. I am happy that we found another incredibly nice buyer who seems to appreciate the car(s) as well and wish him / them many years of safe, trouble free and enjoyable motoring with mr. Red. Thanks once more to Scott, the man behind Saabnet.com for providing such an incredible place on line for Saab owners to help one another, to buy and sell, learn, and so much more. I could not imagine the process of buying or selling a Saab without Saabnet being there to provide a steady supply of people who also appreciate these special cars. Thanks also to my loving wife for letting us be the people with too many Saabs for so long, and for loving and appreciating these inanimate objects as much as I do. Happy motoring to all, from a slightly (very) saddened Saabnut. …and then there were 3.